Wait! It’s April already! 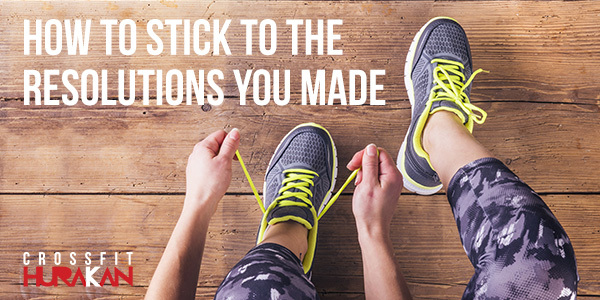 Keeping resolutions four months on – is a million times harder. Once the Easter’s buzz wears off it’s easy to lose motivation. Thankfully to help you stay on track we have a few tips to get you back on track and consider your goals accomplished one by one. Don’t focus it on appearance Make sure you connect every resolution to a goal that has nothing to do with your appearance, for example, let’s say you want to lose a few kilos but instead of becoming obsessed with the scale, link your goal to something unrelated to your weight-loss goal like doing a pull-up, or running a marathon. Incorporate your goal on your daily life Invest in some equipment, find pieces that work for your home and create your own workout space. Also, keep your running shoes nearby and have an outfit ready to go. If you keep organised and eliminate potential barriers, you’re less likely to talk yourself out of working out. Cleanse and eliminate toxins Most resolutions are usually associated with health and getting a fresh start in the new year, a detox is a way to kick off a weight-loss routine and feel more sustained energy. Also helpful is resetting with a clean-eating plan. Don’t go to the extreme If you completely deprive yourself of your favourite foods your healthy-eating resolutions just won’t work. Instead take the time to meal prep and to plan a menu in advance will be the best way to do this. Whether you choose a meal kit delivery service or dedicate time yourself on Sundays to prepping for dinners during the week, you’ll be less likely to turn to takeout after work. Make healthy eating fun Trying different cooking techniques and exploring new trends. Venture outside of your comfort zone by taking a crack at a new recipe, or purchase a new, unique bottled sauce to use on whole-wheat pasta, grilled chicken or fish, or to simmer your favorite seasonal veggies in. Stay dry… but not too much It’s all about moderation when it comes to booze. It’s so much easier to stay on track with healthy eating if you don’t drive yourself crazy with withdrawal, so go ahead and have a cocktail (or mocktail) every now and then. Positivity vs negativity Choose a goal of something you want to do, something you are passionate about and something that you are going to want to stick with even on your worst days. “Don’t put harsh restrictions on yourself that allow one bad day to have the power to make yourself feel like a failure. Quality over quantity That’s what we love about CrossFit, we have very dedicated coaches that would make a real effort to teach you the appropriate technique for each movement until you can feel confident on every task in front of you set by your coach or life itself. Help yourself to a new App Technology nowadays is moving in an amazing fast pace and to find a new app that help you to keep track of your progress is not hard either. Having a plan to follow keeps you accountable and pushes you even more.